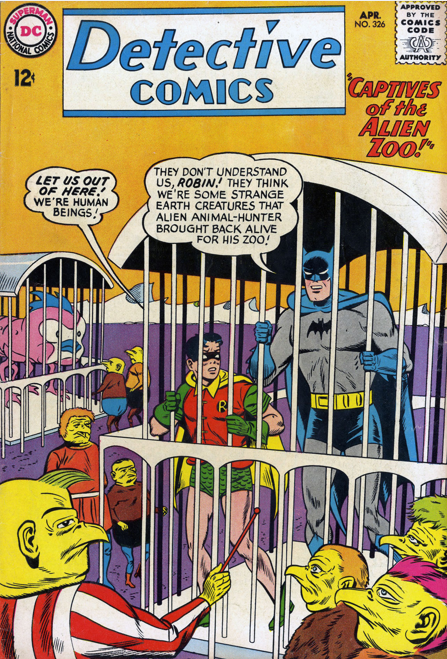 Batman and Robin become performers in an alien zoo in the Sheldon Moldoff tale from Detective 326 (April 1964). They get rounded up by aliens who do not distinguish them from the other Earth animals they are gathering. Once in the zoo, they become star performers. 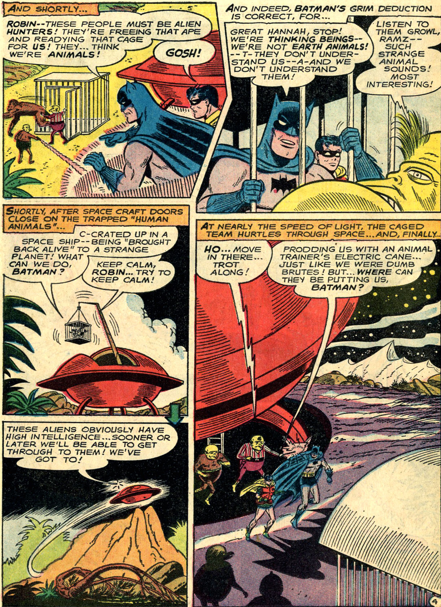 Much of the entertainment value in this story is meant to be derived from watching Batman and Robin perform silly stunts for the amusement of goofy looking aliens. Eventually they prove their intelligence, and are recognized as sentient beings, and sent back home. The Martian Manhunter’s series comes to a close with this issue, which sees some huge changes to the series before it switches books. The Idol Head of Diabolu is introduced, and emits its first monstrous effects, a destructive gas cloud, and it also makes a man emit energy beams from his eyes. 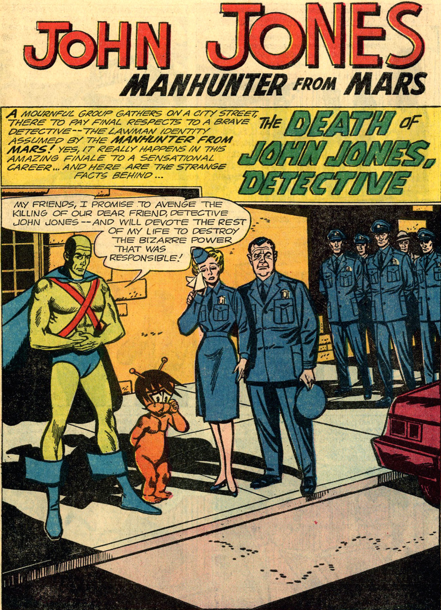 J’onn frantically tries to deal with both threats, both as the Manhunter, with Zook in tow, and as policeman John Jones, working with Diane Meade. The police see the cloud descend on John Jones, who survives it, but uses the situation to fake the death of his human identity. 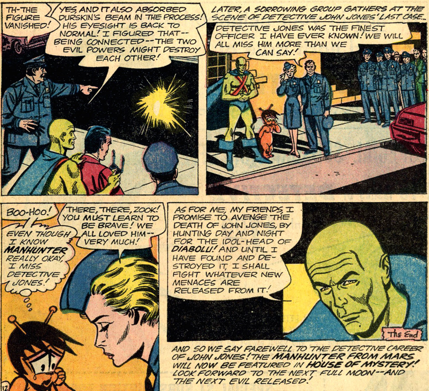 J’onn gets the eye beam man and cloud together, and they neutralize each other. But he joins Diane and Zook for the funeral of John Jones. The series moves to become the cover feature of House of Mystery, bringing Zook and the Idol Head with it. Diane is left to mourn her former partner in ignorance of his actual survival. 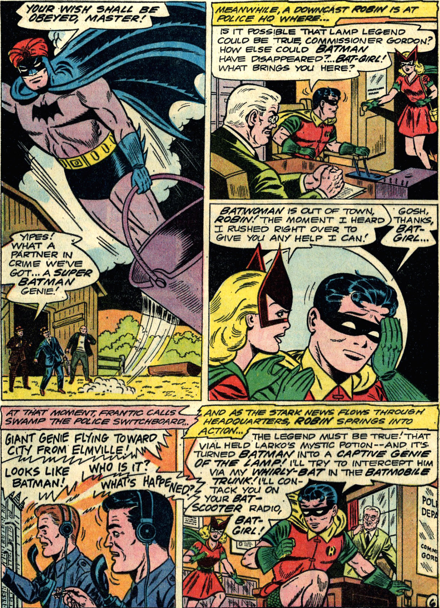 Bat-Girl Betty Kane makes her first appearance in this book, after a number of appearances in the pages of Batman. 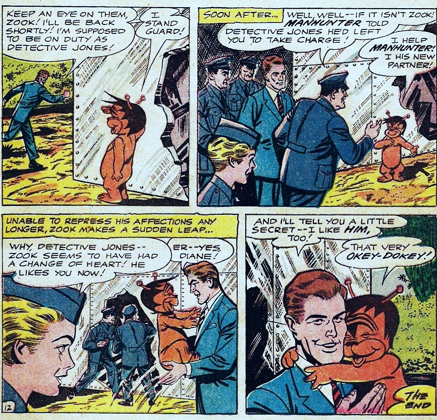 Detective 322 (Dec. 63) gives her and Robin the starring roles in this Sheldon Moldoff story. 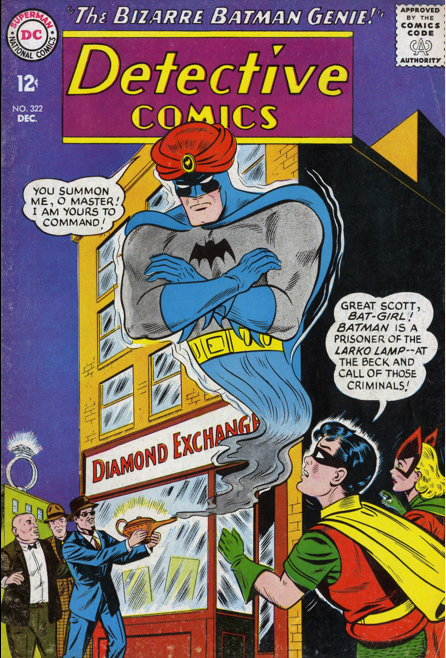 The story involves a formula that turns a person into a genie until they fulfill three wishes, and Batman is the one to get doused with it. 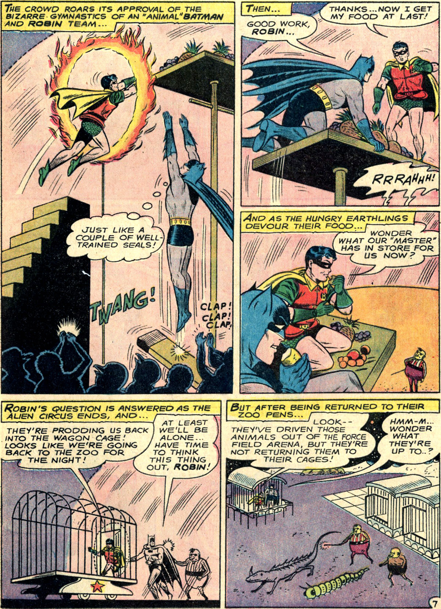 The criminals try to use him to commit thefts, but Robin and Bat-Girl race around preventing this. A silly tale by any standards, this is a sign of how low the series had fallen. 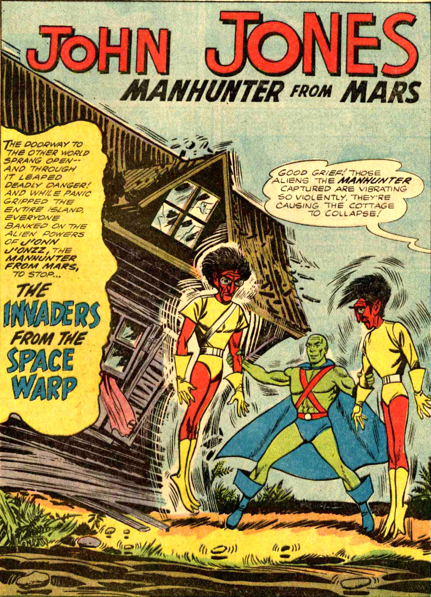 Arnold Hugo returns in this story, having his first battle with the Martian Manhunter. 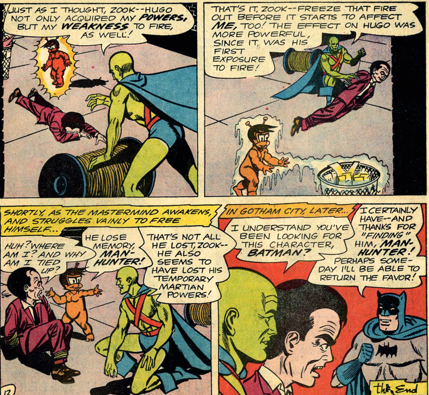 Alerted by Batman, J’onn goes after Hugo, but falls prey to a machine he invents that siphons off part of J’onn’s powers. 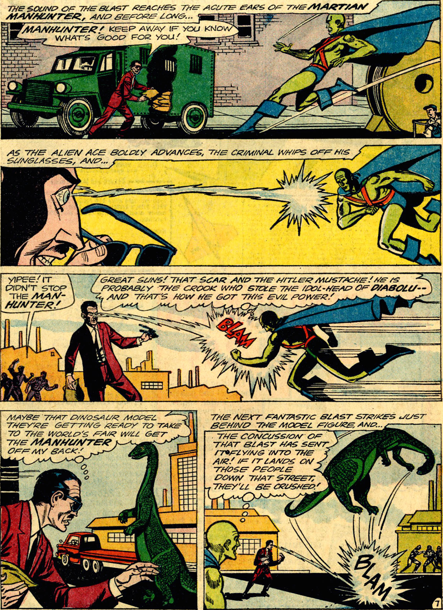 J’onn figures out that it also would have siphoned off some of his weakness to fire, and gets Zook to heat up and weaken Hugo enough to be beaten. 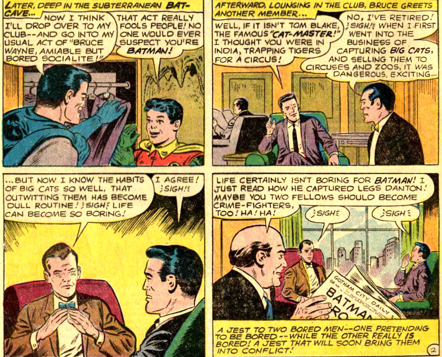 Batman cameos in the final panel. 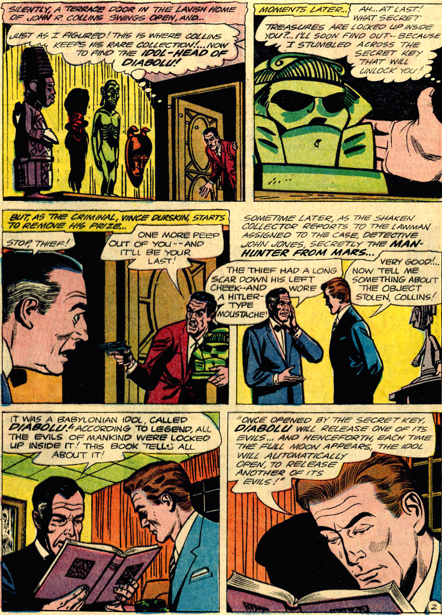 Arnold Hugo returns to face J’onn again after his series moves to House of Mystery. 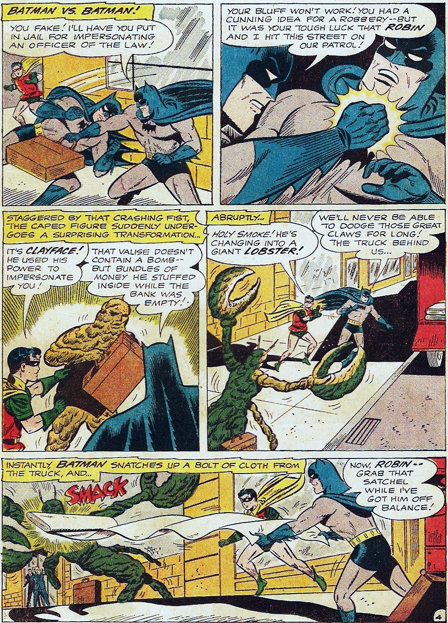 Clayface is back again for his third round with Batman and Robin in Detective 312 (Feb. 63). 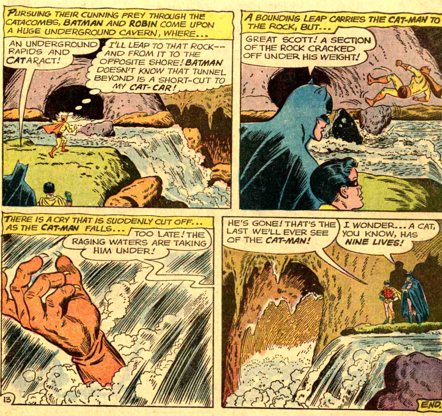 Matt Hagen once again escapes from prison and recharges his powers from his secret pool in this Bill Finger/Sheldon Moldoff story. 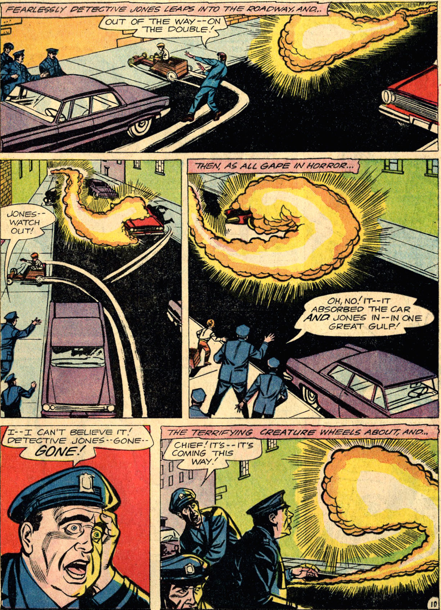 At first, Hagen uses his powers to impersonate Batman, entering banks and warning people to leave immediately, and then looting. 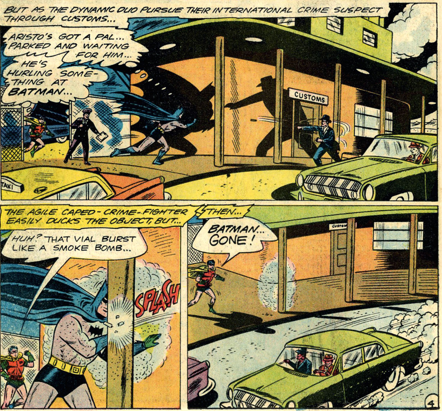 But Batman catches him at this, and Hagen flees. 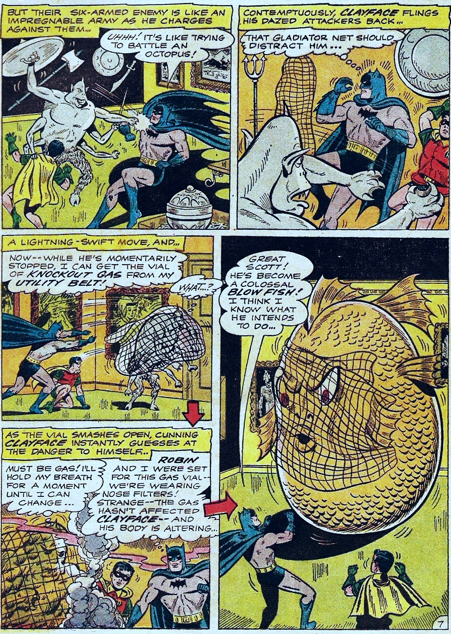 Batman stops another scheme, in which he makes himself appear to be a work of art to gain access to a vault, but manages to follow him back to his pool when he goes to recharge. 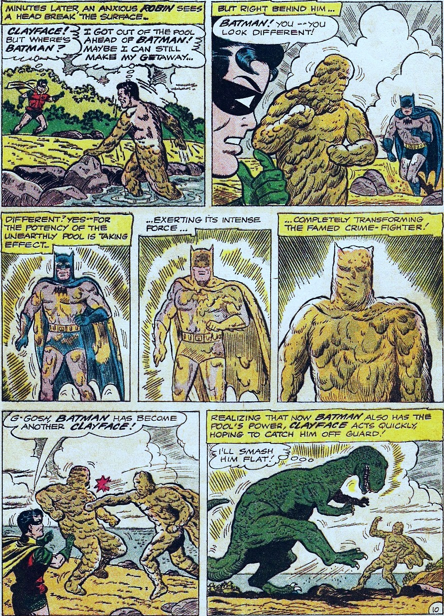 In their fight, Batman falls in, and becomes a Clayface creature himself, leading to the big climactic, shape-changing battle. 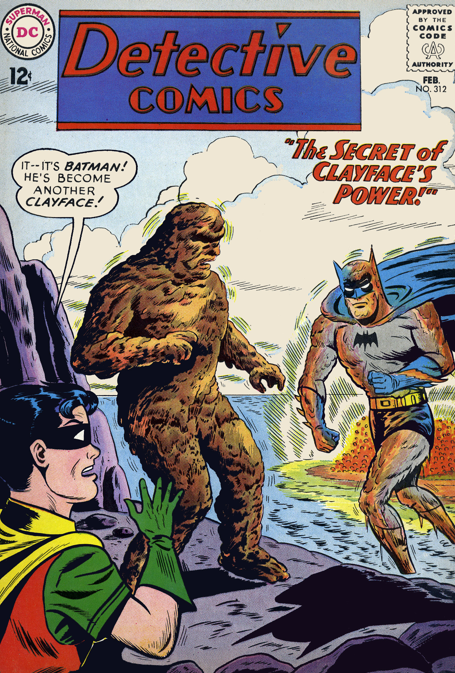 Which ends when Batman, as a tree, punches Clayface in the head. A bit of a let down. Clayface returns in a few months in the pages of Batman. 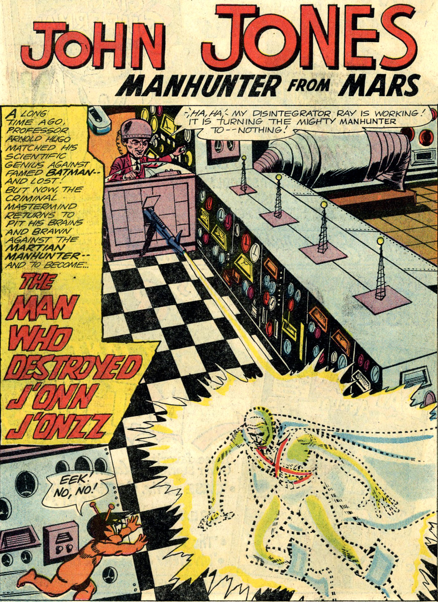 Zook is much more in focus in this Martian Manhunter story. 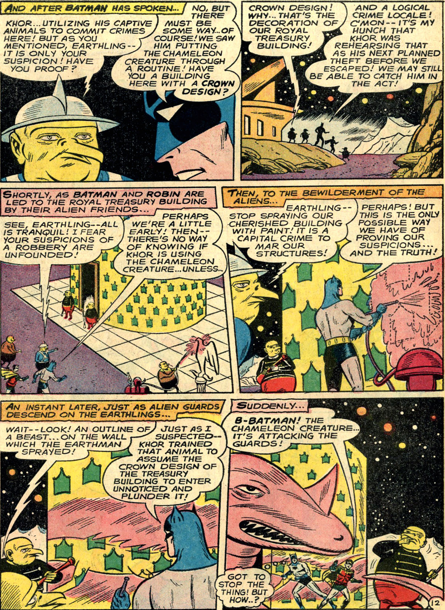 J’onn keeps the creature in a cave, from which he keeps escaping, wanting to get in on the action. 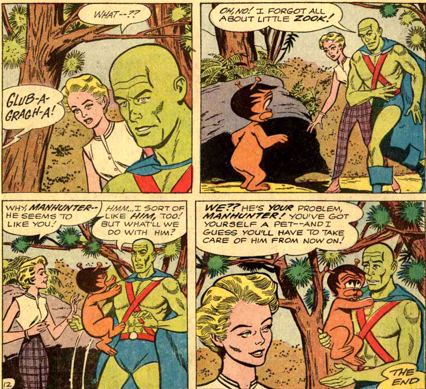 Zook, who can turn red and radiate heat when stressed, messes up one of J’onn’s plans, barging in when he mistakenly thinks J’onn is in danger. 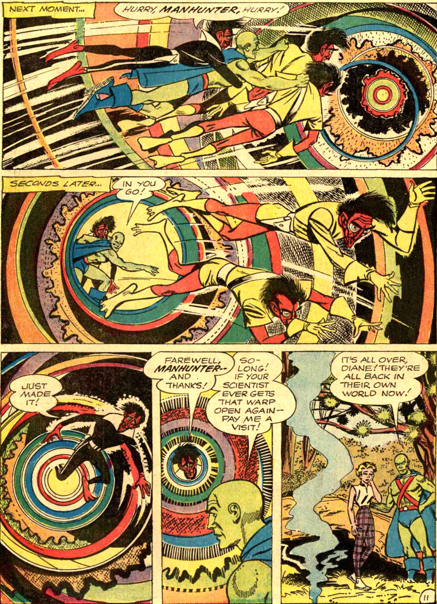 When he escapes a second time, he runs into Diane Meade, who brings him to the station, where he encounters J’onn in his John Jones identity. 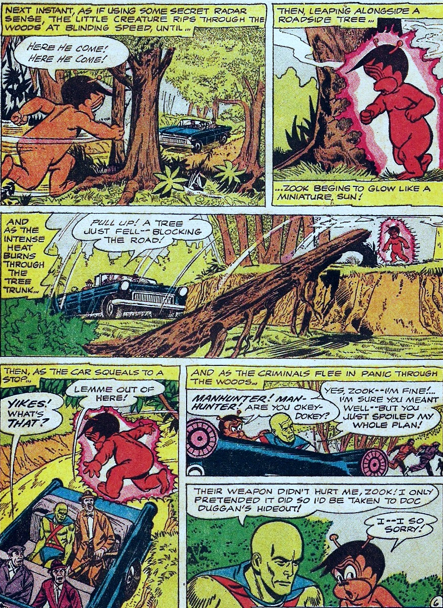 But in the end, Zook winds up using his heat powers to melt a cube J’onn is trapped in by some bad guys, which convinces him the creature could be his sidekick, and doesn’t need to spend the rest of it’s life alone in a cave. 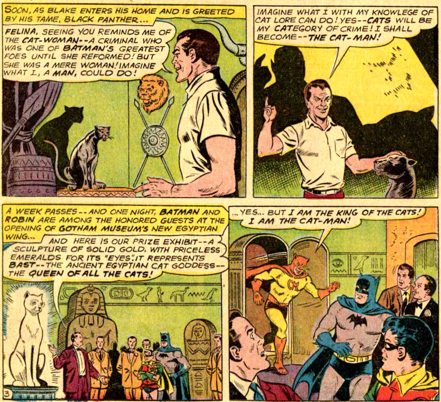 Cat-Man makes his debut in Detective 311 (Jan. 63), in a story by Bill Finger and Jim Mooney. 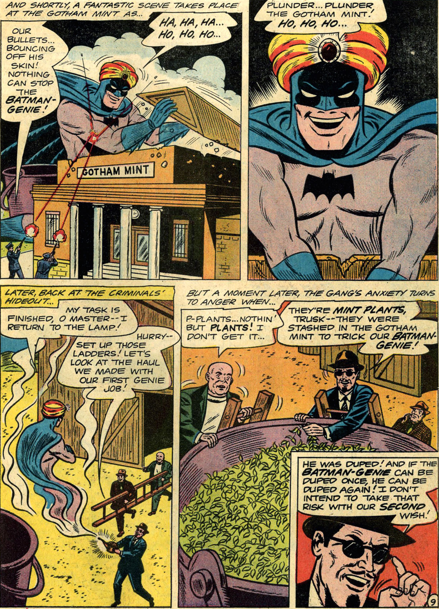 Thomas Blake is introduced as a member of the same social club as Bruce Wayne, having just returned from a sojourn in Africa. 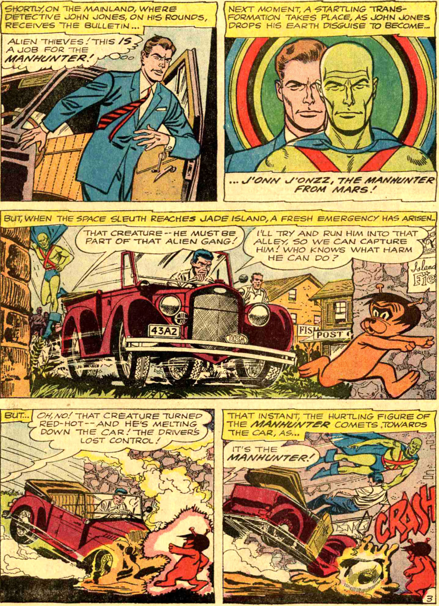 Parallels are drawn between the lives of Wayne and Blake, just as in the introductory story of the Cavalier. When he comes into confrontation with Batwoman, Blake immediately starts trying to romance her, but she rebuffs him. 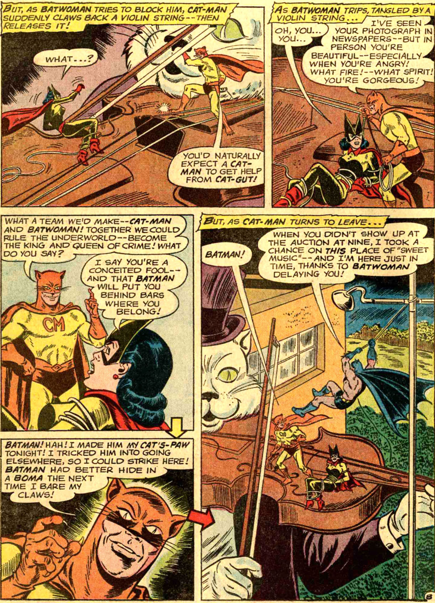 A few rounds with Batman, a giant, robotic cat, and Cat-Man appears to die by drowning, but the story as much as tells us he will be back. 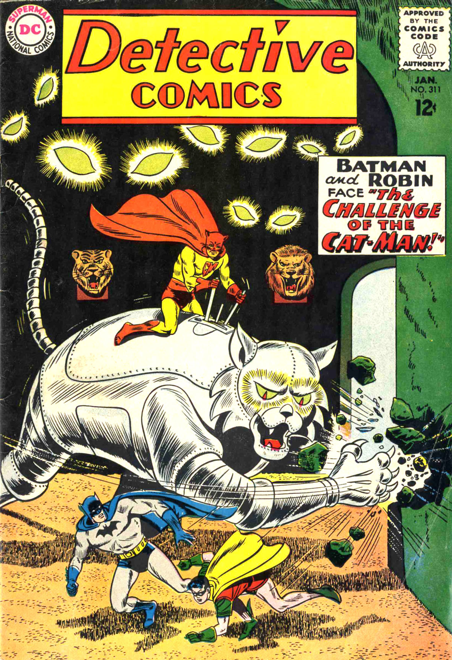 In hindsight, this story introduces three of the concepts that later Cat-Man stories will build on – his parallels with Batman, his romance with Batwoman, and the nine lives idea, casually floated in conversation in this issue. Two alien criminals come through a really funky space warp to Earth, pursued by an alien bounty hunter, and little alien creature called Zook. 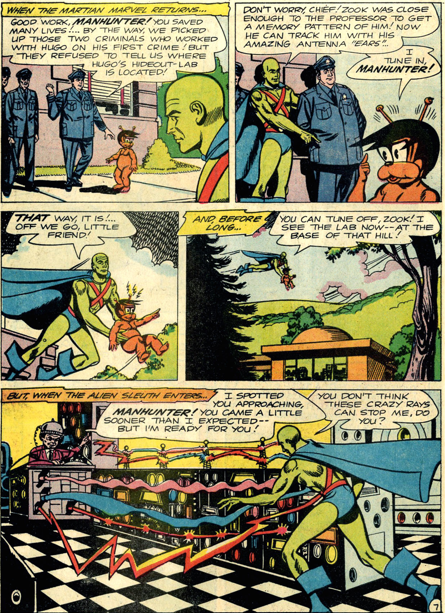 J’onn gets caught in the middle of the whole thing. Zook, although he will stick around, is really a peripheral character for much of this story, which centres on the lawmen and the chase. The trip they take back to their planet is certainly the most vibrant scene this series has had. 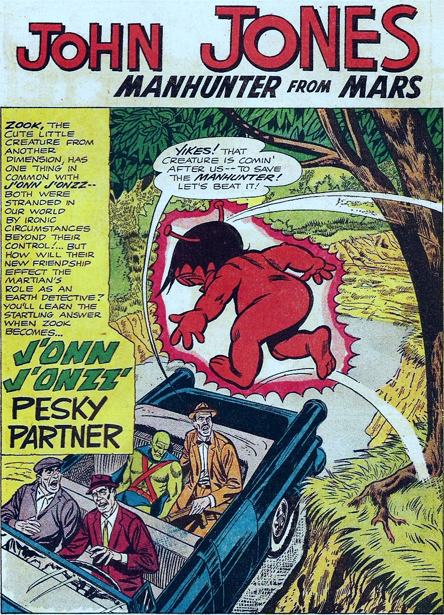 As I mentioned, Zook stays behind, sort of adopted by the Martian Manhunter. Diane Meade also gets to know the creature, which becomes important in the following issue.